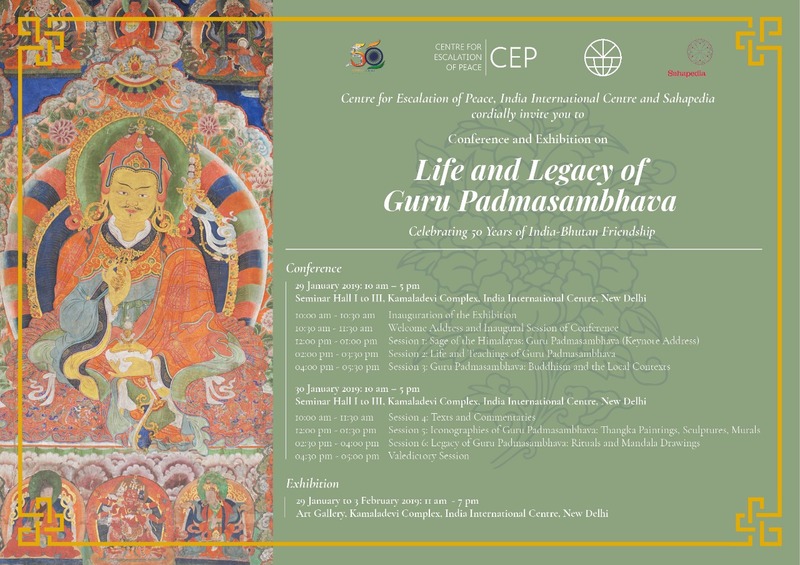 Guru Padmasambhava, also known as Guru Rinpoche (the Precious Guru), is an important figure in Buddhism who was instrumental in establishing Vajrayana Buddhism in Tibet around the 8th century CE. Although this may not be widely known, there were initially three schools of Buddhism—Hinayana (which is now also known as Theravada), Mahayana and Vajrayana. While the Theravada and Mahayana schools have always had followers in India, the third school, that of Vajrayana (which is the ritualistic path of Buddhism), gradually disappeared in India between the 8th and 13th centuries, concomitant with the decline and destruction of the schools of Nalanda, Taxila and Vikramshila. However, because of Guru Padmasambhava’s teachings that he had taken to Tibet during his lifetime, the Vajrayana tradition—as we know it—continues to survive and flourish. This is one reason why Guru Rinpoche is also known as the ‘Second Buddha’. ‘He did for Buddhism in the Himalayan region, what Adi Shankaracharya did for Hinduism,’ says renowned folklorist Prof. M.D. Muthukumaraswamy. Guru Padmasambhava, which translates to ‘Lotus born’, is believed to have appeared in a blossoming lotus as an eight-year-old in the kingdom of Oddiyana. [i] While Gautam Buddha attained enlightenment at a later stage in his life, legend has it that Padmasambhava was incarnated as Buddha—the awakened one; and at the moment of his birth, he announced that he had incarnated to ‘accomplish the actions of Buddhas of the past, present and future’. [ii] Interestingly, Gautam Buddha predicted his birth in the Mahayana Mahaparinirvana Sutra. One day before attaining the state of nirvana, he announced to his disciples that 12 years after his death, ‘a remarkable being with the name Padmasambhava will appear in the centre of a lotus’. [iii] Often called the second Buddha, Padmasambhava is revered by followers of Vajrayana Buddhism as both Amitabha (he who is infinite) and Avalokiteshvara (the embodiment of all buddhas). Padmasambhava also established the first Buddhist monastery in Tibet, at Samye (present-day Lhoka). According to legend, after various unsuccessful attempts by Santaraksita to build the monastery, he suggested to Trisong Detsen, the 38th emperor of Tibet,that the tantric master Padmasambhava be invited to build the monastery. By using a thread-cross called namkha, and through the tantric form of the Vajrakilaya dance, he pacified the local spirits. 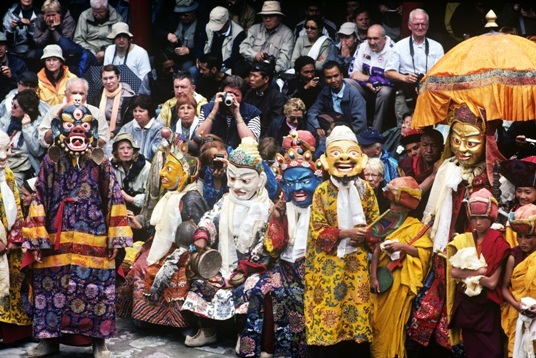 Speaking about this event, the fifth Dalai Lama Ngawang Lobsang Gyatso is known to have said, ‘the purifying energy of his dance forced the malevolent spirits into a skull mounted on top of a pyramid of dough.’[v] Padmasambhava’s tantric dance cleared the ground and the monastery was built in 767 CE. [vi] The Vajrakilaya dance is performed even today by Buddhist monks. It is believed that the areas where his shadow fell on the ground, marked the boundaries of the Samye monastery. Perhaps Padmasambhava’s greatest legacy was establishing the Nyingma sect—the oldest of the four major schools of Tibetan Buddhism. According to the Testament of Ba (the earliest written account of Buddhism in Tibet), Trisong Detsen requested Padmasambhava to translate Buddhist texts into Tibetan and reinvigorate Buddhist thought in the region. Along with 25 disciples (females and males), 108 translators and Santaraksita (the abbot of Nalanda), he translated various Buddhist texts to Tibetan. It is believed that the grand translation project took years to complete. Padmasambhava supervised the translation of the scriptures while establishing the tenets of Vajrayana Buddhism, hence earning the title of 'Buddha of the Vajrayana'[vii]. It was Padmasambhava who, through his efforts and teachings, helped counter the negative connotations attached to the practice of tantra—using love, compassion, gratitude and non-violence—and promoted the ritualistic method as a means to attain moksha. Other than his contributions towards the foundation of Buddhism in Tibet, Padmasambhava also left behind ‘termas’, hidden teachings concealed by him and his consorts for discovery in the future by ‘tertons’ (enlightened minds), destined to find the termas. In Vajrayana Buddhism, the termas can be tangible objects hidden in the earth, lakes or in the sky, or intangible—those which come to tertons as revelations. The written termas are usually in the Dakini script, which only a terton can decipher. 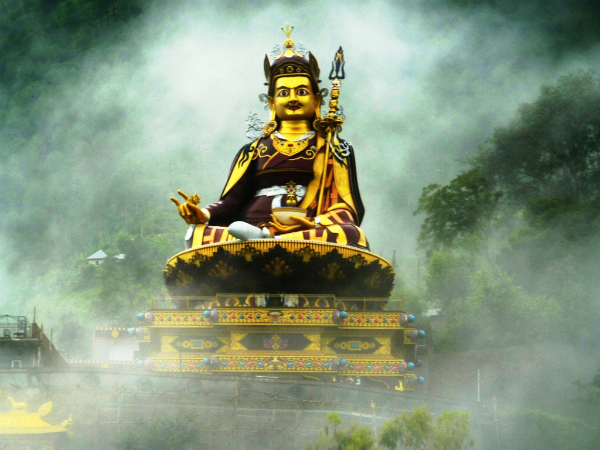 Over the centuries, Guru Rinpoche’s teachings have spread far and wide, and his influence has grown from just the Himalayan region to other parts of the globe. According to scholars, he represents a consolidation of many strands of culture ranging from yogic and tantric practices to meditation, art, music, dance, magic, folklore and religious teachings. Recognised for the significance and impact of his teachings by all Buddhist sects, Padmasambhava’s stature is evident in the iconography in most Buddhist monasteries in the Himalayan region. Most of these feature a statue of Guru Padmasambhava, alongside that of Gautam Buddha and the image of one of the Bodhisattvas (most often Tara, Amitabha or Maitreya). 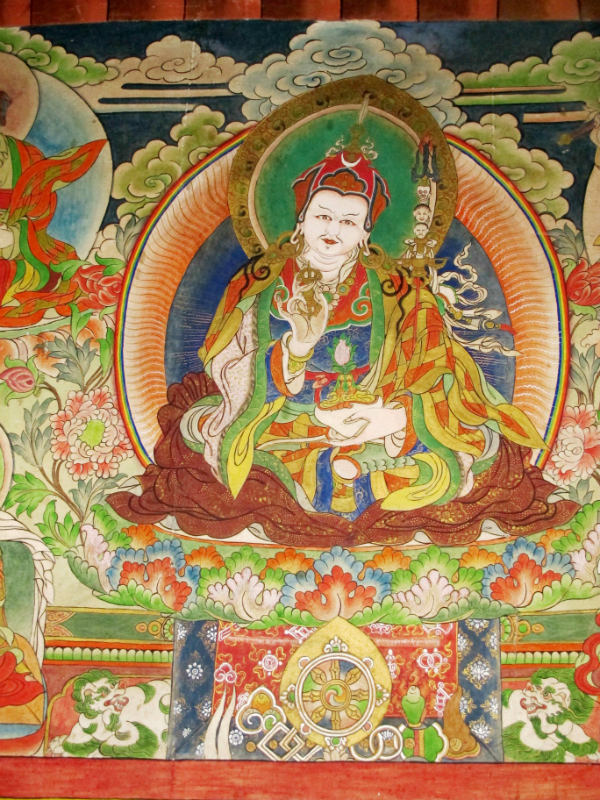 While it is nigh impossible to encapsulate his life and work in a single page, it’s safe to say that the world owes its knowledge of Vajrayana Buddhism to Guru Padmasambhava, the Precious Teacher. [i] The location of the kingdom is still disputed but it is widely conjectured that it was in the Swat district of Pakistan. However, some sects also believe it to be in Odisha.